PITTSBURGH — Technically, the calls were different. In the Pittsburgh Steelers huddle, however, the translation was the same: Get the ball to Le’Veon Bell and get out of the way. 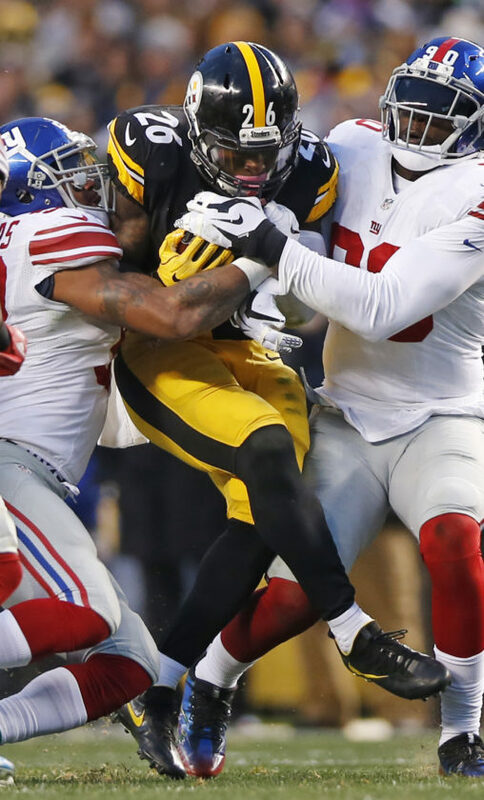 Six straight times in the fourth quarter last Sunday against New York, quarterback Ben Roethlisberger took the snap, turned around and put the ball in the hands of Pittsburgh’s increasingly versatile and seemingly tireless running back. And six straight times Bell pushed the pile forward, protecting the lead, the ball to help put the finishing touches on a 24-14 victory. The offense that talked about putting up 30 points every week hasn’t reached that total during the three-game winning streak that’s pulled the Steelers (7-5) out of a midseason swoon and back into the thick of the AFC playoff race. Instead, Pittsburgh is leaning more heavily on a dominant line and Bell’s fresh legs. Roethlisberger has thrown it 94 times and handed off 87 times over the last 12 quarters. While he insists it’s simply taking advantage of what the defense is giving it, there’s a little bit more at play. The wide receivers behind Antonio Brown have been a bit of a mess due to injuries and the defense is young and thin, particularly along the line. So why not burn the clock, give it to one of the best all-around players in the league and take your chances? One that might not be so great for fantasy owners but works pretty well on the actual field. It might not look as pretty on the scoreboard as it did while averaging 34 points in their first four victories, but it seems the Steelers are fine with ditching style points for substance. The explosiveness Pittsburgh showcased early in the year has been replaced by something more pragmatic. The Steelers have 17 scoring drives this season of 10 or more plays. Six of them have come over the last three weeks. It’s also taken some of the pressure off a defense that has risen from 30th in yards allowed to a respectable 14th over the last month. While there are at least two calls out of the six-lineman set that send Hubbard out for a pass, in reality when he’s in the game there’s not much disguising what is coming. The fact the Steelers are able to execute anyway is a testament to execution. That’s why the vibe was so electric during that clinching drive against one of the league’s best defensive lines. Turns out “keepaway” can be just as effective as putting the scoreboard on tilt. Considering the wintry conditions that potentially await in Buffalo (6-6) on Sunday, the most direct path to the playoffs will likely continue to be through Bell. That’s fine by him. “I was born for this,” he said.